Earlier this week I reached out to a friend who I have not spoken with in a while….probably in a couple years…asking if they wanted to meet up for lunch to reconnect. "Let's talk soon because I miss you hearing the sound of my voice. Ok, I really I miss you like Hillary misses votes. But for real, I miss you like the biggest loser misses bacon. I miss you like an old man’s urine stream misses the toilet. I miss you like an idiot misses the point. I miss you but probably not as much as you miss me, cause I am pretty awesome. I was just thinking about how I miss you, but most of the time I am just wishing you would step on a Lego. Ok, I actually miss you enough to stop making jokes about it." Note: The more inappropriate ones were taken out, but you get the picture. That is just the type of relationship we HAD. Patiently, I waited to get their smartass response……the anticipation was killing me…..and then it appears in my inbox a few days later. "Hey. Funny email! What’s new in your world?" The response was lackluster and not the humorous response I was expecting to get, so I just simply asked if they wanted to do lunch. That is when I got a response that resulted in many tears and the decision to do some serious self-discovery. You see, the last couple times we got together to touch base they pointed out that I didn’t ask one single question about THEM! Not about their job. Not about their family. Not one thing about their life in general. It led them to question our friendship. They decided to stop making an effort to see what would happen. As I mentioned before, it was nearly 2 years that went by! That hurt bad. Not because I thought they were being unkind, but because I didn’t realize that I was being so self-centered and hadn’t been asking about THEIR life. It really made me sad that they were feeling that way and I didn’t know about their feelings, or didn’t realize it. Even sadder that they didn’t tell me about it and we were just left to drift farther apart. Not at the fault of them, but by me! Never in a million years did I expect to go this long without talking to this person, because they have been such a huge part of my life for 16 years! Over those years have relied on them and their friendship for so many different things in my life (highlights and very lowlights) and I feel horrible if I didn’t return the favor. 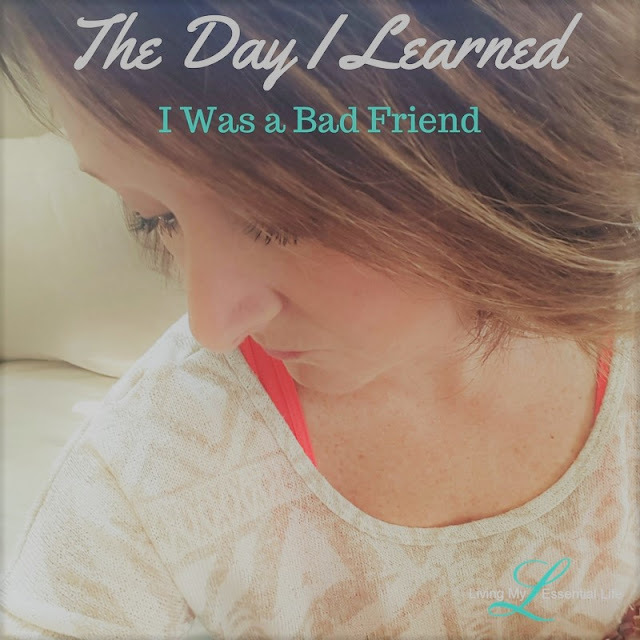 That was the day I learned I was a bad friend! Not only did I neglect this person for years, I was selfish with the time I had with them! Not only did I let time & distance get the best of our relationship, I disregarded THEIR life while I had it in front of me. This is not the first time this has happened. There have been many really close friendships I have had that I just let slip away. On purpose? No! Probably just because life happened. A new job. A new relationship. Moving out of the city. Graduating from school. Getting married. Starting a family. I was not giving the effort that relationships need to stay healthy! Then I started to question all my relationships. Was I also a bad daughter? Am I putting in as much effort as I should be? Should I be making more phone calls? Should I be scheduling more lunches and dinners? Should I be visiting people more often? Should I be asking more questions about them? Should I be sending more letters? Should I be more supportive? Should be listening more and talking less? Should I be asking if they need help with something? The answer is YES! Yes – I should! So, why am I am telling you all this? No, it is not for sympathy! It is to get you to think about YOUR relationship! Yet again, this same person, who selflessly was ALWAYS there for me – no matter what – showed up again! Maybe unaware this time, but they showed up. That was the day I learned I am a bad friend. Today is the day I become one!